Sheila Reid will not compete in the London Olympics for her native Canada in 2012. Reid yesterday won the 5000 meters at the Canadian Olympic Trials, but did so in a rather pedestrian 16:15 (the Trials were held at altitude in Calgary) -- well off either the Olympic "A" (15:20) or "B" (15:30) standard. Reid would have earned an automatic berth on the team had she run faster than 15:20 and finished among the top three at the Trials. She might well have made the team as well via the so-called "Rising Stars" provision adopted by the Canadian Olympic authorities, but she fell short of qualifying for that as well. 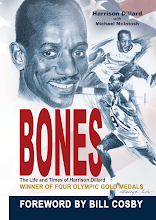 Briefly, the "Rising Star" provision stipulates that a non-"A" standard athlete could be named to the Olympic team if (a) no other athlete in the event had achieved the "A" standard, and (b) the athlete in question had achieved two "B" standard times within the window. The first stipulation was met, as no Canadian women had run under 15:20 for 5000 meters in the allotted time window. Reid herself had come close, but her PR 15:23.64 run on April 21st was just a few seconds short. Megan Wright came close as well, running 15:21.75 eight days later. However, the second stipulation (possession of two "B" standard times in the event) evidently scuttled Reid's chances. Reid had run the "B" standard only once -- not twice -- and therefore was seemingly not a live option for the "Rising Star" exemption. In the women’s 5,000m Tarah Korir put up an excellent fight, leading the first nine laps of the twelve-lap race. Korir was passed by fellow Athletics Toronto athletes Sheila Reid and Megan Brown, who sailed into the finish with times of 16:15.23 and 16:16.44 respectively. 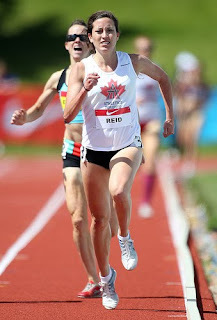 Reid holds the Olympic “B” standard in this event and could be eligible to compete under the Rising Star status should Athletics Canada deem the one “B” standard enough. Evidently, Athletics Canada did not deem one "B" standard sufficient to name Reid to the squad, even though she won the event at the Trials. Indeed, the decision by Athletics Canada to leave her off the Olympic team was appealed, but that appeal was rather quickly denied. As a result, Canada will send no woman to London in the 5000 meters. Villanova fans will recall that Carrie Tollefson won the 2004 US Trials at 1500 meters, had only the "B" standard, and by virtue of her Trials victory was the sole US representative in that event at the 2004 Games, despite there being other American women who held the "A" standard and who finished in the top three at Trials. Winning the Trials with a "B" standard was deemed sufficient in that case. In addition, Marina Muncan, another former Villanova All-American, was named to the Serbian team last week as the country's sole 1500 meter representative once she attained the "B" standard. In Tollefson's case, the USATF respected the Trials enough to name its winner to the team, even if it meant leaving off the team two other women who had already run the "A" standard. In the Muncan case, having someone represent the country in the 1500 meters was important enough for the Serbian Olympic authorities, despite their choice not having the "A" standard. In Canada's case, it's obvious that Athletics Canada did not take their own Olympic Trials seriously: (a) they held the Trials at altitude, virtually guaranteeing that no "A" standard was attainable in the distance events, and (b) they denied the 5000 meter winner at the Trials a spot on the Olympic team, despite that person possessing a send-able "B" standard and without having to deny any other "A" standard person a spot on the team. Canada would rather send no one to the London Games than allow a qualified "B" standard Trials-winning runner to go. Finally, Athletics Canada has declared that it will not allow any Canadian athlete to chase the "A" standard (or, in Reid's case, a second "B" standard) once the Trials were completed. At bottom, Reid just missed the "A" standard at both 1500 meters (4:06.00 -- Reid ran 4:07.77) and at 5000 meters (15:20.00 -- Reid ran 15:23.64) and was forced by the Trials schedule to pick one event to gain a spot on the Olympic team. 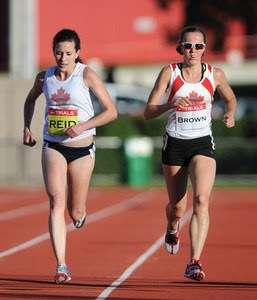 With two "A" standard women in the 1500 meters, neither of whom had any incentive to run fast at the Trials (they'd make the team merely by finishing in the top three, no matter what the time), Reid opted for the 5000 meters. She won the race -- and the Canadian national title -- but in a time that was neither a "B" (as required by the Rising Star provision) nor an "A" (which would have guaranteed her a spot on the team). At the end of the day, Reid came tantalizingly short of a spot in two events. The athletes chosen for the Canadian squad are listed HERE.